When the light dragoon field uniform was radically replaced by a jacket and shell in 1784, the officer’s dress coat remained as prescribed in 1768, though now in dark blue. 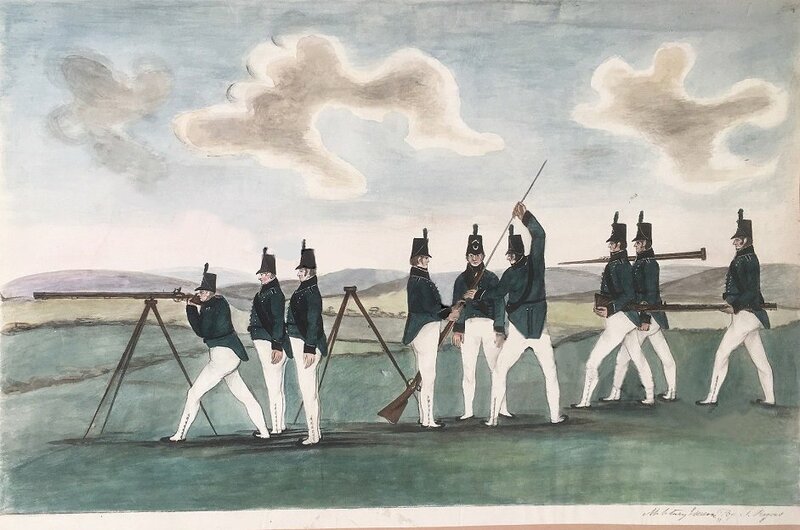 This oddity was ironed out in 1788, when a new dress coat was introduced; a fine drawing of an 11th Light Dragoons example of 1798, in the Welch and Stalker pattern book at the V&A, shows the new style to have been a version of the 1784 jacket, but with longer skirts and full double turnbacks edged with two rows of braid. (For the texts of the 1784 and 1788 orders, see Hew Strachan’s indispensable British Military Uniforms, pages 112 and 115.) This was certainly an update, but meanwhile the officer’s jacket had moved on to the 1796 closed “hussar” style, leaving the coat still a step behind the fashion curve. 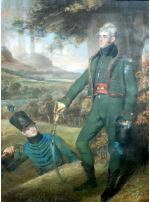 Two other drawings in Welch and Stalker, both for yeomanry dress coats of 1801 and 1803, show that the final version of the coat used the richly laced and buttoned jacket style front, but keeping the full skirts, with those curious three branched pendant ornaments introduced on the 1784 jacket. And that’s what we have here. A skirt ornament (a silver star between script “GY”) has gone, and the scarlet is patched here and there, but it’s still a breathtaking item: the heavy silver braid, interwoven with buff, is particularly impressive, and on the cuffs and turnbacks the double edging is laid onto a scarlet “galloon” to show a scarlet light, which is real quality. It’s the only surviving garment I know of for the 1803 Grimston Yeomanry, or “Grimston Hussars” as they also liked to be known. (It could even be the very coat referred to by William Vaughan, tailor to Captain Thomas Grimston, when he enquired if the new “scarlet regimental frock” should “be made Hussar fashion, same as the last.” ) Is it the sole surviving light cavalry dress coat of its type? Offhand, I’m really not sure how long these coats lasted in the regular light cavalry; for a start, they seem to have been abandoned by regiments converting to Hussar status. I have a vague recollection of an order prescribing them to be worn with cocked hats, breeches and shoes for “court” occasions – or was that for riflemen? Same thing, I guess. Feel free to set me right. The brief but startling report below appeared in the Kentish Weekly Post or Canterbury Journal for Friday 3 February 1804, appended to reports of storms and so forth from the paper’s correspondent in Frant, near Tunbridge Wells, clearly an enthusiast for italics. It re-appeared in a number of papers for that month – the Chester Courant, the Lancaster Gazette, the Staffordshire Advertiser and probably others, since column-filling copy was freely filched in those days, and soon went viral (or as viral as anything could be in 1804), arriving by April almost word for word in The Balance and Columbian Repository of Hudson, New York, and no doubt elsewhere. A very ingenious young man of the name of Smart, a journeymen taylor in this parish, has invented an infernal machine, which, when placed in any point of contact against an invading force, is capable of destroying a thousand men in a minute. The expence, I am told, will be small when compared with its utility. He leaves this [place] on Monday morning to explain to the Duke of Richmond, the Lord Lieutenant of the County, of[sic] the model of his machine, &c.; it has met the general approbation of all the Gentlemen Volunteer Officers in that neighbourhood; the inventor is a volunteer himself, though a tailor. Should it meet the approbation of the Duke of Richmond, Smart will undertake to conduct it himself into the center of the enemy’s legions; the great merit in the construction of this machine is, that he can remain in perfect safety in the center, while he deals death and destruction to all around him, and he is capable of re-charging in ten minutes; and it can be moved with one horse, with the greatest facility, at the rate of eight miles an hour. In the British Library copy of this paper the original owner, a compulsive annotator, has noted beneath in wobbly copperplate: “Remark the above”, as well he might. So far, I’ve been unable to discover the Duke’s reaction, on which the papers seem silent. Not very enthusiastic, one suspects. Nor does there seem to be any image of Smart’s model of his invention, but the description may give some clues. “Any point of contact” suggests something circular, on a turret principle, while “a thousand men in a minute” surely implies a primitive machine gun; note that “re-charging” would take a full ten minutes. And for the operator to “remain in perfect safety in the centre” must have required some sort of protective plating. What comes to mind is a one-man, horse-drawn version of Leonardo’s celebrated armoured vehicle of 1487, or maybe a covered version of James Sadler’s “moving battery”, or “curricle flying artillery” discussed in this post. (Though Sadler’s vehicle required one man to load and one to fire, plus a driver.) I’m left wondering how Smart’s machine would have gone on if and when the horse was shot, which seems the obvious weakness. Out-do the Chisel, Brush and Pencil. And so on. 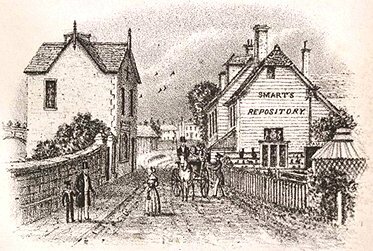 In his later years, Smart cultivated a conspicuously eccentric character, but his notoriety and affluence faded, and on his death in 1846 he was given a pauper’s burial. A useful outline of his life and career by James Gregory is available here, and a full length study by Hector Medora, focused mainly on the folk art, is downloadable here. A Smart blog, promoting the art book by Jonathan Christie, is here. Finally, my favourite Smart collage, a version of his Earth Stopper. 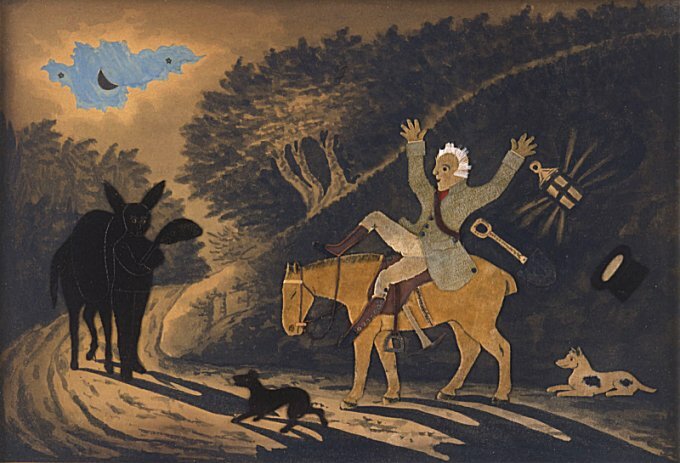 The effect of the “apparition” on the gent on horseback must be akin to that anticipated by Smart of the appearance of his infernal machine among the enemy legions. Perhaps … one of the best appointed corps in the kingdom … all active, spirited young men, ready to follow their commander into any danger. to load, and firing on their bellies. on whose arrival at the ground the corps, being previously concealed among the bushes, commenced an independent firing, when nothing but the report had any tendency to show from whence the shots proceeded. We understand that an experiment will be made by a party of Captain Ware’s Rifle Corps, to ascertain the degree of expedition with which they could travel in case of emergency. They are to start on Wednesday next the 13th inst. from York at six o’clock in the morning to proceed to Hull, when they are to halt two hours, and return again to York, where it is supposed they will arrive about six o’clock the same evening. The excursion will be attended by several military gentlemen. On Wednesday morning at six o’clock, a Machine, built in this city for the purpose, started from the Tavern with 22 men fully armed and accoutred, &c. who, with the Machine, weighed 383 stone, or 2 ton 63 stone … The Machine was drawn by four horses, on which were two postilions. They arrived at Hull within four hours, notwithstanding the traces of the horses broke twice, which caused a considerable delay; besides a further delay of waiting for the post-horses at Market-Weighton, owing to a mistake in the orders. We believe the above is the shortest time in which such a number of men have been conveyed so great a distance, and reflects much credit on Capt. Ware’s patriotic exertions; as it fully demonstrates in how short a period a number of men may be conveyed to any part of the kingdom, by having similar Machines in readiness at different places. In an era when a respectable day’s infantry march might be reckoned at 15 miles, this demonstration of ten miles an hour by a horse-drawn personnel carrier over doubtful roads must indeed have seemed impressive, though it’s maybe as well that such “Machines” were never put to the test en masse in the event of invasion.